You don't need meat for this meal. Vegans, vegetarians, and those celebrating with them can rest easy this Thanksgiving weekend: Nobody needs to suffer through a tofu-turkey dinner. From unorthodox mushrooms to nut-based breads and inventive imitation meats, options abound for herbivores beyond the standard roast-flavoured lumps of soy. On The Coast food columnist Gail Johnson gathered some tips for a perfect poultry-free feast. Going all veggie "only makes sense, seeing as how the holiday is a celebration of the harvest," Johnson told On The Coast host Gloria Macarenko. "And hey, it falls on a meatless Monday." 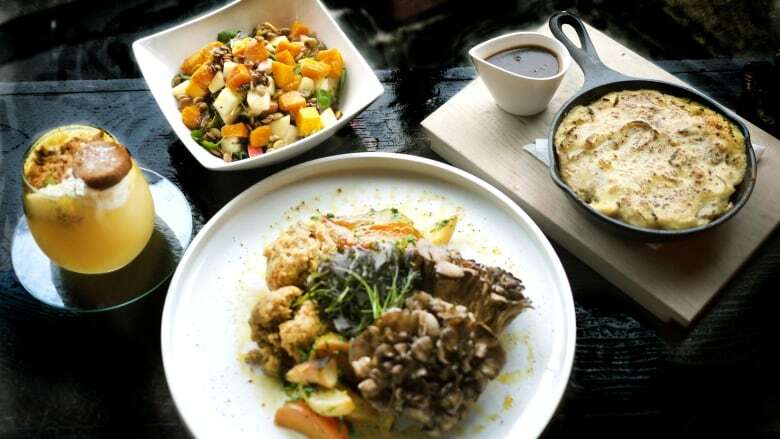 But rather than merely offer a selection of sides, Brian Luptak, head chef of Vancouver's Acorn Restaurant, suggests building the meal around a mushroom-based main. It's peak season for "chicken of the woods" mushrooms, the orange-hued stemless growths that mimic shelves or coral, often spotted on trees and rotting logs. "These mushrooms absorb sauces or oils like sponges and actually do taste a bit like chicken," Johnson said. As with any wild mushroom, start with a small portion to see if you have any sensitivity to it, and don't forage for it yourself unless you're with an expert. Luptak advises roasting and frying them and serving them with vegetarian gravy — he flavours his with burdock root to give it an earthy depth. "If you want to stick with mushrooms you're more familiar with, you could make a mushroom duxelles potato gratin," said Johnson. That involves sautéeing any grocery-store variety fungi with garlic, onion and parsley, then layering it with Parmesan cheese and sliced potatoes, before baking the dish until browned and aromatic. Without meat, Johnson warns a cook might be tempted to rely too heavily on root vegetables. "Regardless of whether there's turkey involved, I tend to keep going back to the stuffing and the mashed potatoes," she said. "But if you add in other starchy vegetables, like corn, yams, beets, and winter squash on top of those, you're going to have a bit of starchy overload." Harper Yungwirth, general manager of health-focused chain eatery Tractor Foods, suggests adding toasted walnuts, pecans, or pumpkin seeds to side dishes. "These will not only add texture but protein as well," Johnson said. Brussels sprouts are a seasonal favourite, says Johnson, and they can be taken to the next level with a maple glaze. Sautéed bok choy can also add important micronutrients to the meal, while a kale salad with cranberries or apricots — plus those toasted nuts — lend the table a splash of colour. If you're still looking for a meat-free alternative, Victoria-based Very Good Butchers makes a stuffed "turkey" breast made from organic white beans, Johnson said. For dedicated chefs and experimenters, Yungwirth likes to make the 'Nut Loaf' recipe from the Hollyhock Cooks cookbook. It has mushrooms, brown rice, crumbled tofu and almonds — something different to carve at the centre of the table.